The late Buck O’Neil, star first baseman for the Kansas City Monarchs and ambassador for the sport of baseball, recalled in his autobiography that he once heard a unique crack from the bat of Bo Jackson, a crack he had only ever heard off of the bats of Babe Ruth and Josh Gibson. Nearly 25 years later, the Minnesota Twins would sign an extraordinarily gifted teenager from the Dominican Republic, who since his professional debut in 2010 has torn the cover off of the baseball. That young slugger is Miguel Sano, a 20 year-old power-hitting phenom who has dazzled the Twins organization and its scouts with plus raw power and hitting ability. The sound emanating from his bat after connecting with the ball is astonishing, reminiscent of the unique sound produced by Jackson that once bellowed throughout Royals Stadium and even the sounds off of the bat of Los Angeles’ Josh Hamilton, who similarly impressed coming up through the Tampa Bay Rays system over a decade ago. While Sano profiles to be the first power hitting third baseman for the Twins since the days of Gary Gaetti, a fellow countryman from the Dominican Republic has also displayed a big bat while playing the hot corner. 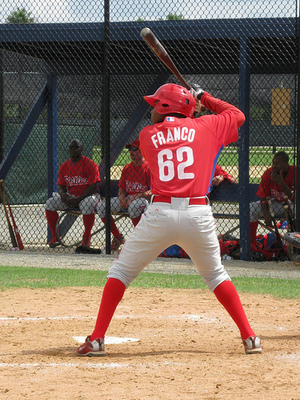 His name is Maikel Franco, arguably the premier prospect in the Philadelphia Phillies organization, who like his Minnesota counterpart wields impressive raw power and hitting ability. Sano has received high praise as the premier talent in the Twins organization over the past two seasons; however, Franco has failed to garner such attention across the minors until recently, as he finished up the season having torn apart Eastern League pitching. 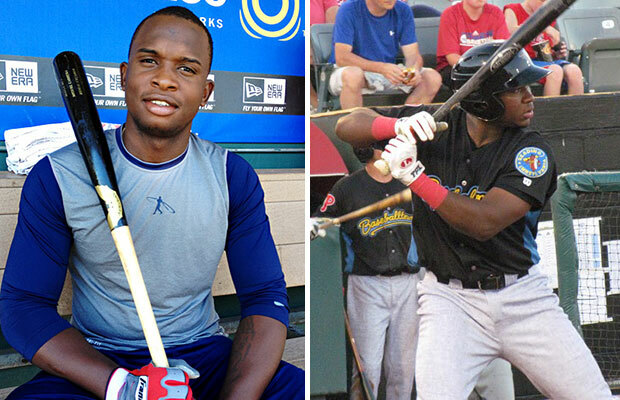 It’s hard to argue against the notion that both Sano and Franco are the two premier third base prospects in the game. However, the question must be asked, that of who is the better overall prospect? Furthermore, the broader question of who will become the better big league player can be posed as well. While I will not explicitly answer those questions, I will, however, offer an analysis of both prospects that entails a brief scouting report overview of their respective tools, progression thus far in the minors, and what to expect from each next season. From here, one should be able to gain (if they feel so inclined) a better feel for who they believe is the better prospect and will become the better player at the next level. Sano is an impressive physical specimen. He’s listed at 6-3, 195, but he appears to be well over the 200 mark, perhaps at least between 225-230. He has a strong frame, arms, and hands, all of which contribute to his natural brute strength at the plate. He appears to possess a natural feel for hitting, as he is able to generate solid bat speed, getting the bat to the zone with great speed due to his strong arms and hands. He can be inconsistent with his approach and swing mechanics, as he can be aggressive and will often get out front on secondary pitches. Although he has improved his pitch recognition over the course of the season, Sano places a priority on power, wherein he gets long with his swing and as a result is prone to strikeout at a rather high rate. The goal for Minnesota has been to allow him to become more contact-oriented, in turn improving his plate discipline and pitch recognition skills. However, due to the fact that he already possesses decent plate approach (albeit inconsistent at times) and a more power-oriented, lofty swing, the Twins organization will likely shy away from further altering his swing, as such could pose a hazard to his future development. In terms of power, Sano’s is off the charts. Possessing excellent bat speed, strong arms and hands, and a lofty swing, Sano has steadily improved his weight shift, incorporating his lower half into his swing and is able to stay back due to an increased trust in his hands. He can drive the ball to all fields (and out of them) with ease and has consistently displayed such power in game time action this season. Due to his bulky, strong frame, concerns have been raised over whether he will be forced to move away from his natural spot at the hot corner (prompting a potential move across the diamond to first base). Despite the concerns, Sano’s defense has gradually improved throughout the season, as he displays solid instincts that should allow him to become a good everyday defender at the corner. He needs to work on his footwork and getting the ball out of the glove quicker, but his surprisingly athletic approach gives him positive projection for the future. Sano raked a combined 48 home runs between time at the Appalachian and Midwest Leagues between 2011 and 2012 before exploding for 35 homers this season with High-A Fort Myers and Double-A New Britain. In 123 combined games, Sano drove in 103 runs and posted a BA/OBP/SLG line of .280/.382/.610. Although he slugged 19 homers in the second half of his season with New Britain, the transition to Double-A ball appeared to challenge the young slugger as he batted a mere .236 with 81 strikeouts in 67 games. As for Franco, he boasts a strong build of his own. He is listed at 6-1, 180, a less than generous number as he easily appears to be in the 215-220 range. Like his Minnesota counterpart, questions have arisen as to whether Franco will be able to remain at third at the next level due to the possibility of his stocky, strong lower half limiting his movement. Franco possesses a strong natural feel for hitting. He makes consistent contact due to plus control of the barrel and an ability to track the movement of pitches and adjust accordingly. Albeit he has had issues with being over-aggressive in his plate approach, wherein he has had the tendency to jump at first pitch strikes and pitches high and inside the zone, his pure hitting ability should allow him to successfully refine his approach in the future. He will most likely make the transition to Triple-A at the onset of next season, where he will be tested in terms of approach and secondary pitch recognition, which should allow him to make the proper adjustments before making a likely big league appearance later in the season. He is very coachable and has demonstrated his ability to make adjustments in the past, namely in early-2012 when he struggled mightily with getting on base (Franco would go on to have a stellar second half of the season, finishing with an OBP of .336, an increase of .140 points). Although he does not possess the perfect swing, Franco has a very solid one at that. His hands travel deep beyond his hind foot, a longer travel distance than most batters; however, he prevents his arms from barring out by keeping his long arms loose and generating plus bat speed. He possesses superb weight transfer, wherein he is able to shift and rotate his hips to get an aggressive jump on the ball, which in turn with his bat speed allows him to generate plus power. On the field, Franco possesses a strong arm that is both accurate and effective on off-balance throws. For a bigger player, Franco is rather agile at the corner, displaying solid range, good footwork, and can move to either side cleanly with ease. He appears to have a natural feel for the position and consistently makes routine plays, all of which should allow him to become a potential plus defender at third at the next level. Like his hitting ability, Franco’s raw power is another plus offensive tool. He can drive the ball to all fields and has shown very good power down the line this season. His raw power potential fully materialized in 2013, as he put up gaudy numbers with both High-A Clearwater and Double-A Reading. Franco slugged 31 home runs and drove in 103 runs, while posting a BA/OBP/SLG line of .320/.356/.569 in 134 combined games. While Sano struggled a bit in transitioning to Double-A ball, Franco flourished, as he batted .339 with a .363 OBP (a .40 and .14 point increase from his time at Clearwater, respectively). Although both Sano and Franco’s seasons are over, the road ahead is certainly lightly lit. Evident is the fact that both players are multi-dimensional talents in terms of hitting ability, power, and to an extent, defense. 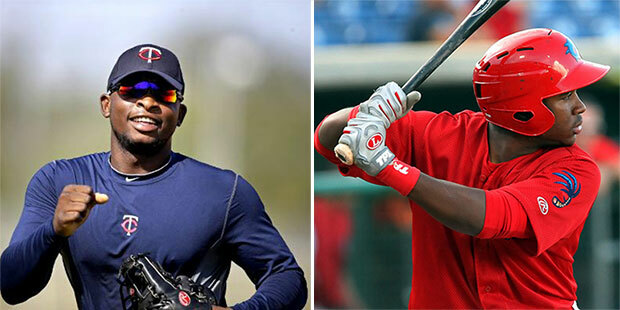 From what we have witnessed thus far, Sano and Franco have developed into two of the game’s top hitting prospects and more definitively, the two premier third base prospects. Both sluggers finished their respective 2013 seasons in the Eastern League, combining for a total of 34 homers and 106 RBI at the Double-A level. Sano produced in terms of raw power, but had some difficulty in adjusting at New Britain. On the other hand, Franco had an easier go-around at Clearwater, handling the more advanced competition in Double-A ball with relative ease. Despite the fact that Franco excelled against Eastern League pitching, many analysts and scouts project Sano to develop into the better ball player. While it can be argued that Sano has been labeled with a higher ceiling, the fact of the matter is that both have demonstrated the abilities that suggest future status as likely all-stars. Both Minnesota and Philadelphia appear to be more than patient with their top prospects, as you can anticipate that both Sano and Franco will spend the majority of next season at both the Double-A and Triple-A levels. If either organization feels that their premier sluggers are ready to conclude their final developmental stages at the next level, expect a likely September call-up (if not, look for both to join their organizations’ big league rosters out of the gate in 2015). Will Miguel Sano become the best power-hitting third baseman for the Twins since Gary Gaetti? 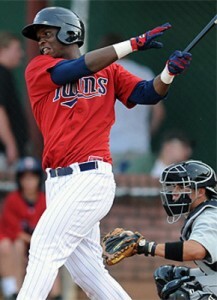 Better yet, will Sano become arguably the best overall impact player for the organization since the late Kirby Puckett? As for Franco, will he become the best overall third baseman for the Phillies since Scott Rolen? Furthermore, will Franco help guide the Phillies back to prominence in the NL East Division? The answers to these questions are yet to be determined. What we can determine is the fact that both prospects have the respective abilities and tools to become the star players that they have been billed as. Time will tell as to whether they harness those talents and properly develop at the next level, but in the meantime we can certainly revel in the impressive performances given by both premier prospects.